This was my first show on the 2011 "Time Machine" tour, and my third for both legs of the tour. I flew down to Phoenix to visit my friend Dan and family and see a Rush show. On our last adventure in 2010, Dan and I traveled to Las Vegas to see Rush at the MGM Grand (Rush hadn't played in Phoenix for the 2010 leg). That had been an amazing show -- and quite a contrast from the outdoor show I'd seen in Washington State at White River Amphitheater. Like the Vegas show, Dan and I got some excellent seats right off the floor -- but on Geddy's instead of Alex's side. Since we were an hour early, Dan and I sat, talked, and did a lot of people watching. 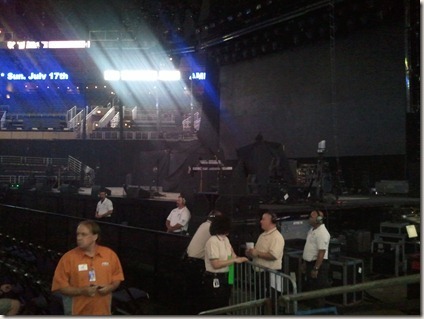 Dan spotted the professional golfer Rocco Mediate backstage, talking to some of the Rush crew. Given that Dan is a huge golf fan (and excellent golfer himself), he was excited to see someone like Rocco there. The next celebrity we spotted was Randy Johnson, former MLB fastball pitcher for (my) Seattle Mariners, (Dan's) Diamondbacks, and the Yankees (among others). He was talking to Gump and a few other Rush crew members backstage. When the other photographers gathered before the show, Randy gathered with them holding his camera. He shot photos during the first three songs, but also took pictures throughout the show (at one point, he took photos behind Neil's kit). Read more about Johnson's love of music and photography here. A friend of mine, Paul Secord, had mentioned how "dialed in" Rush was at a show in Chicago earlier this year, and now I knew what he meant. Not only were they playing tighter, but there was a more relaxed feel to what they were playing. 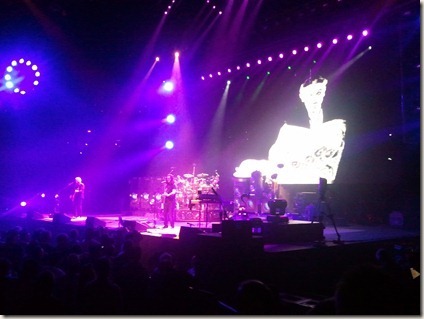 It seemed like Rush had arrived at some new level of musicianship, something that had started during the Test for Echo tour. For Neil Peart in particular, he seems to have found the sweet spot of playing composed drum parts with fire, fluidity, and some improvisation. This difference in feel is one of the reasons the songs have such a nice groove on this tour. Geddy has always maintained a high level of musicianship, and I've rarely seen him make mistakes (which is amazing, when you consider all he has to do). While he's been working on his "Flamenco" bass style since Counterparts, the way he locks in with Neil is one of the signatures of the Rush sound. And he's not afraid to add improvisation at the right moment: At the end of "Leave That Thing Alone," he started ripping on the bass, whipping the crowd into a frenzy. Afterward, he apologized for his "self-indulgence." 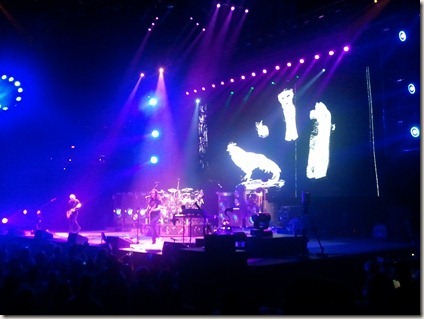 Alex Lifeson also seems to have found a new groove on the "Time Machine" tour. While not as precise as Geddy and Neil, his playing is like an emotional current racing across the rhythm section. In the older songs, like "La Villa Strangiato" and "Working Man," he played solos that made my jaw drop. As I commented to Dan, "Alex is the the most underrated guitar player out there." Concerts are always an interesting place to people watch, but some of what I saw at this show was new to me. Then came the second part of the show, the part where Rush plays Moving Pictures in its entirety. I wondered if I would grow tired of hearing this album by the third show, but I didn't. During "The Camera Eye," I noticed that Geddy wasn't playing anything on the keyboards. The entire keyboard beginning of that song is sequenced (which I understand given that Geddy probably wants a short break ). But on this night, some of the keyboard parts were out of sync somehow -- and Geddy wasn't happy, as he motioned for the guy on the side of the stage to fix it. I've seen this before with Geddy, where he gets visibly frustrated. During moments like this, you get a sense of his perfectionism. Neil's solo was once again amazing -- probably the best I'd ever seen. The looser, more fluid technique helped propel the beginning improvised section. I especially noticed during the "floating snare" section. The electronic section also sounded fresh, but I'm not sure how much he's changed it from last year. The triplet rhythms he plays across the on-the-beat tambourine part are really tricky, especially when he's playing the melodic part on the midi marimba. I'm always amazed how he keeps everything together. And just when you think he can't do more, he shifts to the "Love for Sale" section. I remember getting a little bored with the horn sections he played in the 90s (like the solo on Show of Hands), but the Jazz sections of his solos since Vapor Trails have always kept my interest and are the perfect climax for the solo. From "Closer to the Heart" to the end of the show, the "Time Machine" set built to a crescendo. While I used to tire of "Working Man" on previous tours, I think the Reggae style at the beginning really helps to keep that song fresh. There are moments in "Working Man" where Rush seem like they're just jamming -- like you walked into their garage. While the solo section of this song isn't as structured as, say, the middle sections of "Free will," "Caravan," or "Marathon," it's no less interesting. I swear Alex almost set fire to his guitar with the solo he played. Dan and I agreed beforehand that we'd exit during the outro "I Still Love You, Man" film, since we'd seen it already and it would give us a jump on traffic. We dashed out onto the downtown streets by 10:50 and were home by 11:30. As is tradition, we stopped at Wendy's by Dan's house in Tempe. As I was eating, I realized I had salt stains on my t-shirt -- something that doesn't happen to me unless I'm playing drums at a concert. I guess salt stains can happen at Rush concerts, too (especially when the damn AC is broken).